As the title implies, this will be an action-packed entry. As well as marking the halfway point of the series, Zom-B Gladiator will also introduce some new major villains, including a character who is probably my favourite baddie out of all the books I've written! He's a disgusting creep who will make your skin crawl -- and I've named him after one of my wife's cute little nephews!!! My UK publishers, Simon & Schuster, are planning a VERY special reveal for the Zom-B Gladiator cover. It will be a pixel cover reveal. They're going to create a site for it, and fans are going to be able to go to the site and reveal a pixel by tweeting or sharing a link. As more and more of you do it, more of the cover will be revealed -- the time it takes for the whole cover to be revealed will thus be entirely down to you guys! We think this is the first time this has been done by a UK children's publisher, so we're all very excited about it! More details will appear in a future issue of the Shanville Monthly. Meanwhile, I have posted the release schedule set by my British publishers, Simon & Schuster, for the remaining Zom-B books, OVER HERE. Please note, dates are subject to change, though I don’t anticipate any of them changing by more than a week or two in either direction. American release dates will be around the same time as these (at least for the hardbacks — no schedule has yet been set for a paperback release in the States), and I will confirm the actual dates as and when I learn of them. Before we get to Zom-B Gladiator, we have book 5, Zom-B Baby, to look forward to in late September/early October. I've already shared the British and American covers in earlier issues of the Shanville Monthly. Now I'm going to treat you to a couple of the images that will be appearing inside the book, and there will be another pair next month. 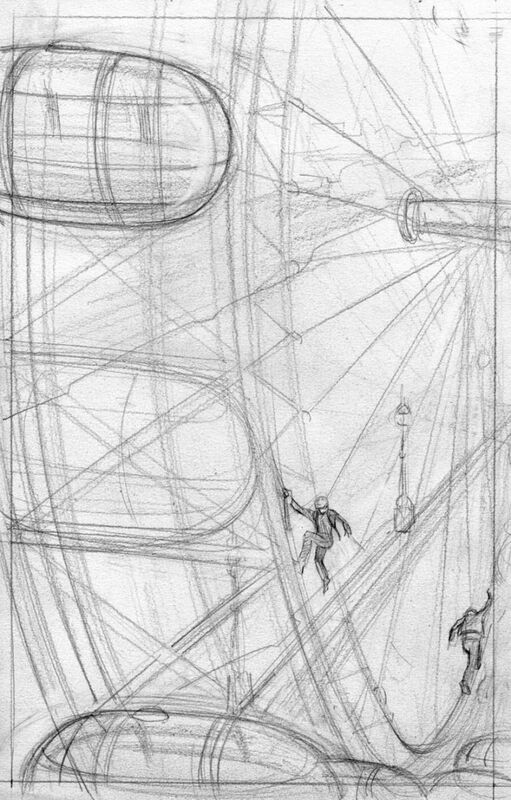 These are by Warren Pleece, and they are rough drafts, not the finished version -- I love seeing these early sketches, and I think it's fun to share them, as otherwise they would go unmarked. In this first image, a bravehearted (or foolish?!?) couple try to climb the London Eye! 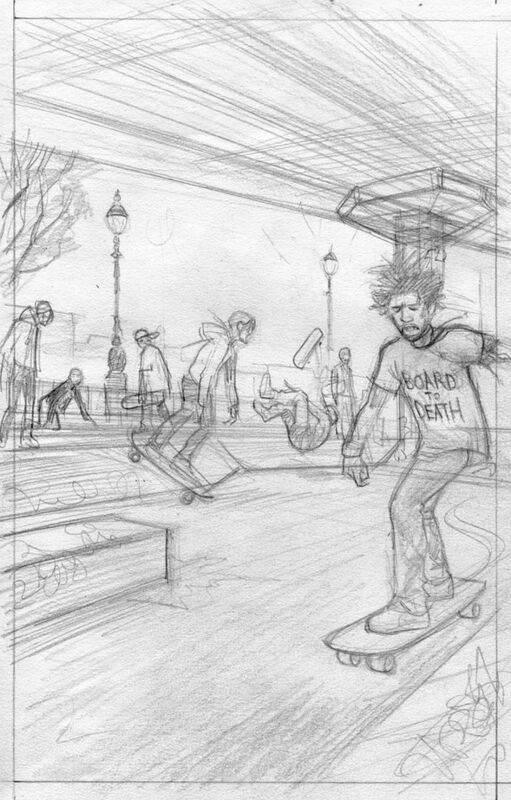 Zombie skaters rule! Even in death!! This scene is actually set in the skating area on the Southbank in London, which is currently under threat of relocation. "Hell no! The undead won't go!" Zom-B Baby goes on sale in the UK and Ireland on September 26th, and in the USA a few days later on October 1st. It will also go on sale in Australia, Canada and New Zealand around the same time. You should be able to find the book in your local shop, or get the staff there to order a copy for you. But if you prefer to order online, you can do so through Amazon UK or Amazon USA. It will also be available to download onto eReaders. CAN YOU HEAR THE ZOMBIES COMING?!? Book 4 of the series, Zom-B Angels, is now also available to download in audio format in the USA, read by Emma Galvin. You can download it HERE. Zom-B Angels is also available to download in audio format in the UK and Ireland, read by Zawe Ashton. You can get it HERE. By the way, as I've mentioned before, Zom-B Angels has been picking up RAVE reviews from fans and critics -- it seems to be the most popular book in the series so far! You can read lots of fan reviews on the Amazon UK site, and catch up with the critics HERE. If you haven't started reading the series yet, I hope that these reviews will convince you to give it a go. And don't forget to tell your friends about it too!!! 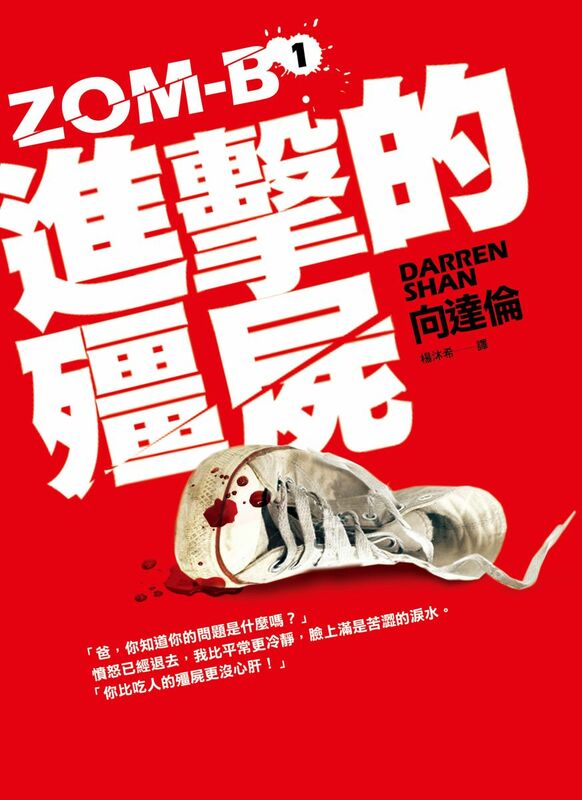 Zom-B is being released in Taiwan on August 12th. My publishers, Crown, have come up with a cover that is very different in style to those of my other books which have been published in Taiwan -- you can check it out above, and view a larger image HERE. While I loved all of the covers for my other Taiwanese books, I have to say that I do approve of the change of style. Zom-B is a much grittier book, and I don't think the more fantastical style would have suited it. 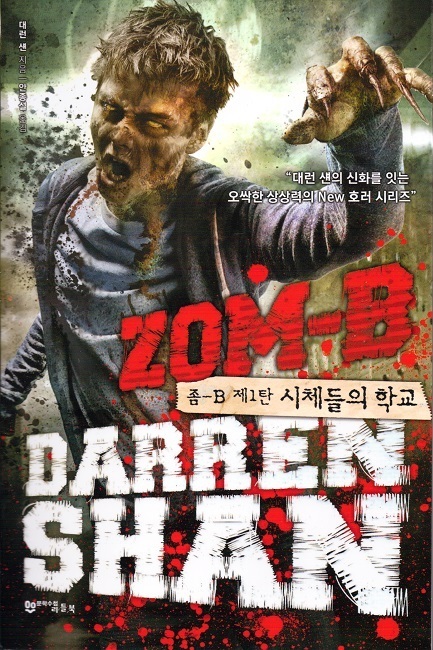 My Taiwanese publishers have an official Darren Shan site, and you can have a look at it HERE. 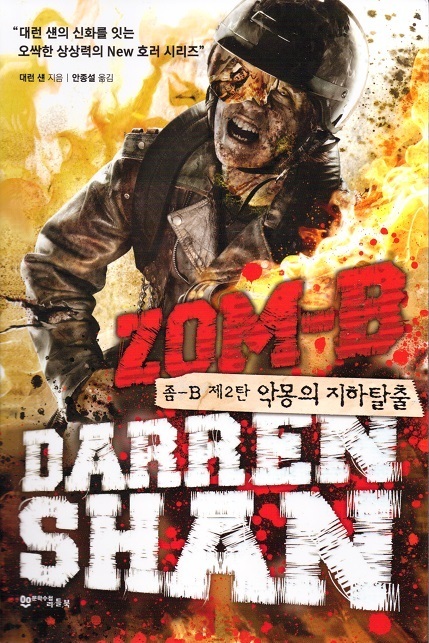 The first 2 books in my Zom-B series, Zom-B and Zom-B Underground, were released in South Korea in July. My apologies for not flagging up their release in advance, but it's a tricky business keeping up with the activities of my books in different countries!! Anyway, the books are on sale now, with the rest of the series due to follow. You can find the covers above, and you can find out more about the books, on my Korean publisher's site HERE. There's also exciting news for Shansters in Finland this month, as I'm delighted to be able to share the news that the manga adaptation of The Saga Of Darren Shan is going to be released in Finnish. The first two books are being released in October, with the rest to follow at a scheduled rate of one every two months. The manga has been released in lots of countries -- to find out if it's been translated into your language, CLICK HERE. DEMONS INVADE "DEAR DEIRDRE!!" In The Sun newspaper in the UK in July, there was a distinctly demonic presence in one of the panels of a photo-enhanced reader's problem on the Agony Aunt page. This reminds me of the time when the character of Dot Cotton was spotted reading one of my books on Eastenders a few years ago! I recorded a piece of radio for BBCR4 Extra which is due to air on Friday August 16th between 4pm and 4.45pm. It was for their Inheritance Books feature, in which I talk a bit about Zom-B, but also about some of my favourite old and new books. You will be able to listen to by CLICKING HERE. I was pleased to see my name mentioned in this American post about the best UK authors (even though I’m actually Irish!!). CLICK HERE. Many congrats to Paris Joy Linday-Murray, for her FREAKILY fabulous top reading prize win in Aberdeenshire’s Teenage Reading Month initiative! CLICK HERE. You can listen to a podcast of a radio interview I did with the Pat Kenny show on July 1st. The interviewer was Myles Dungan. This might only be accessible to listeners in Ireland.CLICK HERE. I have added covers for the Kindle editions of my adult books, the City Trilogy, to my site. Since covers are not so important on Kindle, we decided to use Kindle-generated covers — I was curious to see how they would turn out! The covers aren’t anywhere near as impactful as the physical book covers which my publishers designed, but they do the job in a simple kind of way. You can check them out HERE, and the books are all available to buy via the Kindle store on Amazon UK or on Amazon USA. Please note, these books are intended for adult readers, and as a general rule of thumb I do not recommend them for under 16s. On Sunday 18th August at 1.30pm I'll be heading to Edinburgh in Scotland for my 14th Festival appearance in a row. You can buy tickets by CLICKING HERE. I will mostly be focusing on my Zom-B books, reading out some blood-curdling extracts, although of course I will be happy to answer questions about any of my other books too. And I will be signing afterwards -- as usual, there are no restrictions on the number of my books that I will sign for fans, so bring your whole collection if you feel like it! I'm back on the road in September and October, to support the release of Zom-B Baby in the UK and Ireland. Here are the latest details -- there's still quite a lot To be Confirmed, so check back in September for the full, updated schedule. A public signing is open to everyone. A public event is also open to everyone, but you should check with the venue in advance in case you need to pre-book tickets, as space will be limited. School events are for invited schools only. 4.30pm -- public signing, O'Mahony's Book, Limerick. pm -- schools event, Cork. TBC. 1.20pm -- schools event, Armthorpe School, Doncaster. pm -- public signing or event, possibly in Windsor, TBC. Japanese fans will be interested to learn that the creator of the Saga Of Darren Shan manga, Takahiro Arai, is tackling the book Les Miserables in his next project. I've no idea if it will see print in English or not, but I hope that it does! CLICK HERE. Axel Alejandro Espriella Puente, Mexico. There were 318 acceptable entries, from all over the world. Many congratulations to the winners and better luck next time to everybody else! More competitions coming veyr soon, so make sure you don't miss ay of the upcoming issues of the Shanville Monthly!! !